Extraordinary villa of contemporary style, inserted in a green zone with a fantastic sea view. Composed by three floors. In the first, there is a games room, fitness machines and a storage room. On the second floor, the common rooms, an office, two bathrooms, one social and other complete, laundry room and a kitchen composed of an island system, overlooking the garden, the pool and the sea. Upstairs, there is a master suite with walk-in closet and bathroom, with shower and a jacuzzi tub. Two bedrooms and a bathroom of support complete the floor. Outside there is a fabulous garden with a barbecue area and a fantastic swimming pool with cascade made of rustic stones, releasing a harmonious and relaxing sound with surroundings. 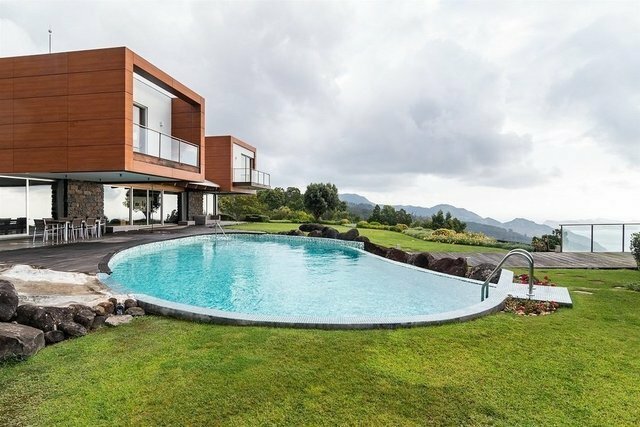 Villa with innovative architectural design and high quality materials, natural stone walls, thermal and acoustic insulation, double glazing, air conditioning in the bedrooms and underfloor heating. Outside a watering well with a capacity of 15 thousand liters of water guarantees the maintenance of the garden.